Ragini Kakubha is the personification of an ancient melody of a woman who is waiting impatiently for her lover. Let the alluring scent of sandalwood, a classic Oriental woody note, the hint of romantic rose and undertone of vanilla bring this mood of love into your space. 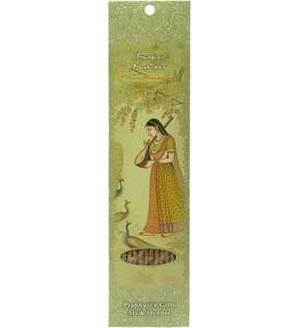 A ragini is a female raga, an ancient melodic form of Indian classical music played in a certain scale of notes with its own melodic form and associated mood. The ragini is always played or sung after its raga, or husband, with its composition reflecting the tantric elements of the male and female energies. The raga-ragini combination evolved from the spiritual practice of Tantra around the 14th century. Together the static and dynamic energies create mood-evoking music.